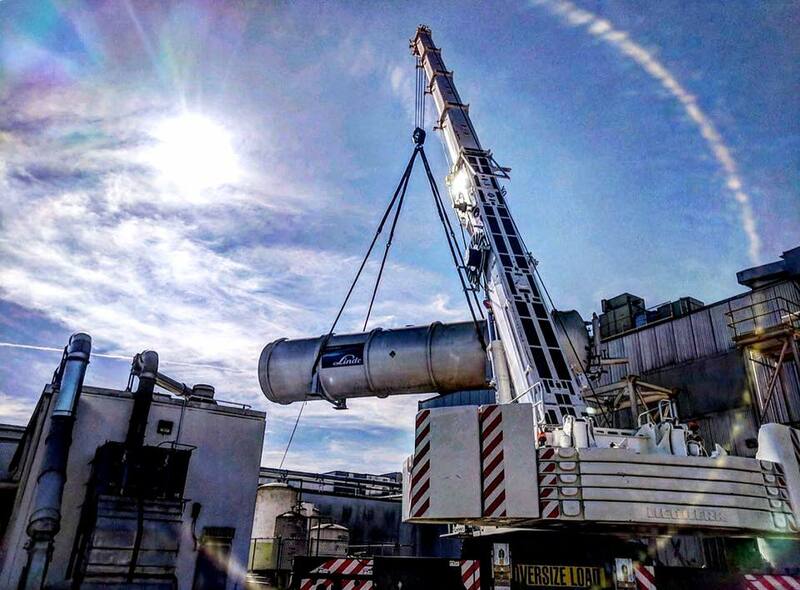 Check out these shots from our nitrogen tank relocation for Linde at Keystone Foods. Moving this 90,000lb tank required special help from our 350T Liebherr. See the project on our Facebook page HERE. Superior Rigging & Erecting was founded in 1952 and has locations in Atlanta, Ga. and Orlando, Fl. Since, we have developed a reputation for completing complicated projects with ease. Services offered include: steel erection, specialized rigging, millwrighting, turnkey plant services, heavy transport, equipment rental, warehousing, art/sculpture installation and more. With wide-ranging services and more than 65 years of operation, Superior Rigging & Erecting offers seamless solutions to the most complex projects. Comprehensive rental options include: crane, forklift, tractor trailer, accessory equipment and more. Benefits of choosing Superior Rigging & Erecting include an expansive equipment fleet which ensures quick availability, a comprehensive preventative maintenance program resulting in safe productivity and a commitment to a zero-accident environment, implemented with an active safety staff requiring complete, ongoing training. Superior Rigging & Erecting: making the tough jobs look easy since 1952. In 2018, we had the pleasure of assisting with the construction of Seminole Hard Rock Hotel & Casino Hollywood’s prodigious new guitar-shaped hotel tower. The striking hotel tower is located off of Florida’s Turnpike in Hollywood, Florida. The hotel is the centerpiece of a 1.5 billion dollar complex underway at the tribe’s flagship Hollywood property, according to an article published in the Miami Herald. The hotel is expected to open this Fall and will feature 806 hotel rooms, a 10-acre lagoon-style pool, 30 restaurants/lounges/bars, an event venue, retail space, an expansive casino, meeting/convention space and more. The massive project supported about 2,000 construction jobs and the hotel is expected to create 2,000 permanent jobs, according to James Allen, CEO of Seminole Gaming and chairman of Hard Rock International, as quoted in the article. Superior Rigging & Erecting is proud to have supported this remarkable project and looks forward to continually making the tough jobs look easy, in Georgia, Florida and throughout the nation. Superior Rigging & Erecting was founded in 1952 and has locations in Atlanta, Ga. and Orlando, Fl. Since, we have developed a reputation for completing complicated projects with ease. Services offered include: steel erection, specialized rigging, millwrighting, turnkey plant services, heavy transport, equipment rental, warehousing, art/sculpture installationand more. With wide-ranging services and more than 65 years of operation, Superior Rigging & Erecting offers seamless solutions to the most complex projects. Superior Rigging & Erecting: making the tough jobs look easy since 1952. This past summer, we were recognized with safety awards in the crane & rigging safety, safety improvement and project safety categories by the Specialized Carriers and Rigging Association (SC&RA). Each year, the Specialized Carriers and Rigging Association formally recognizes outstanding achievements by companies and individuals. This is an incredible honor that we are extremely proud of considering our company places a top emphasis on safety. It is our primary focus of any job. SC&RA is an international trade association committed to advocate, educate and provide networking opportunities to support the industry in operating safely, legally and profitably around the world, according to their website. The SC&RA Awards Program showcases commitment to safety, ingenuity, perseverance and altruism. Our team is honored to receive this recognition and is committed to keeping safety a top priority. Please join us in welcoming this 300-Ton Grove All-Terrain Crane to our fleet! She has 230’ of telescopic boom, 121’ hydraulic luffing jib and arrived just in time for her first job Monday! The Grove GMK5250L was added to our expansive Atlanta-based fleet. The machine arrived at port and was prepped and set-up in Saint Augustine, Fla. before eventually being transported to its new home at Superior Rigging & Erecting Headquarters in Atlanta, Georgia. About The Crane: The Grove GMK5250L is a cutting-edge Manitowac-produced machine. It is a powerfully versatile, five-axle crane which features a highly-rated capacity, best-in-class load chart, best-in-class maneuverability and quick set-up time. 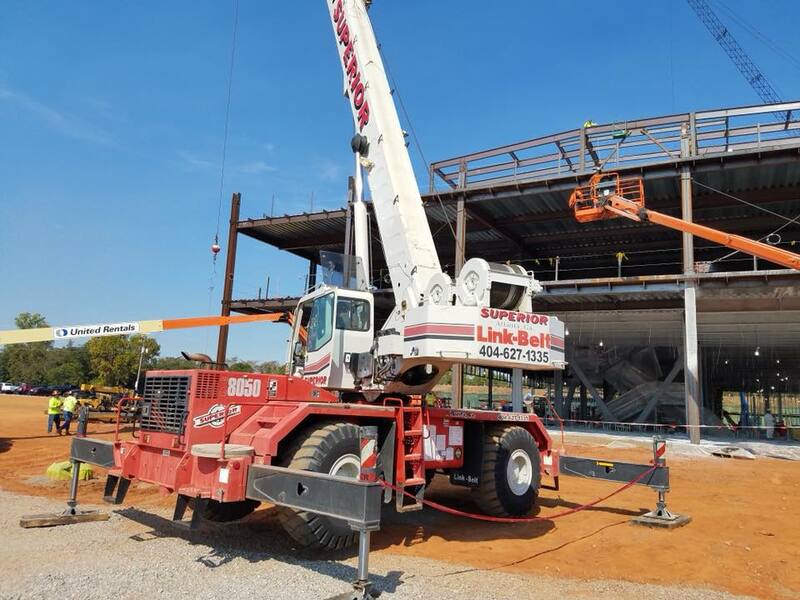 These cranes are engineered to allow multiple counterweight configurations and each boasts a 230-foot main boom, a 39 to 69-foot hydraulically offsettable bi-fold swing-away jib with 26-foot inserts and 176,300 pounds of counterweight. The Why: Here at Superior Rigging & Erecting Co., we are committed to providing only the best for our clients. This addition to our fleet will add an industry-leading, vanguard option for our clients and ensure that we will continue to Make The Tough Look Easy in all that we do! Our team is eager to better serve clients and accelerate productivity with the new Grove GMK5250L. Superior Rigging & Erecting was founded in 1952 and has locations in Atlanta, Ga. and Orlando, Fl. Since, we have developed a reputation for completing complicated projects with ease. Services offered include: steel erection, specialized rigging, millwrighting, turnkey plant services, heavy transport, equipment rental, warehousing, art/sculpture installation and more. With wide-ranging services and more than 65 years of operation, Superior Rigging & Erecting offers seamless solutions to the most complex projects. Superior Rigging & Erecting: making the tough jobs look easy since 1952. This Rental Spotlight is part of a series highlighting the numerous heavy equipment rental options available through Superior Rigging & Erecting. From crane rentals and forklift rentals to transport equipment rentals and more, we have you covered with the tools needed (such as lifting equipment, mobile cranes, heavy trucks, etc.) to stay in budget and finish on time. The Peterbilt 365 w/Manitex TC45127 is a powerful and versatile truck with a telescopic crane. It boasts a lightweight, all-aluminum cab with lap seam construction, aircraft grade fasteners, and bulkhead style doors. The motor in the Peterbilt 365 is built with maximum power and outstanding fuel efficiency to optimize performance in virtually any application. If you’re looking for a premium, ergonomic driver experience with increased maneuverability and outstanding nighttime visibility, the Peterbilt 365 is for you. The Manitex TC45127 Crane on this truck is a versatile telescopic crane with a 127’ main boom, 55’ 2-piece swing away jib, and a tip height of 190’. This crane can be set up quickly with radio outrigger controls. Whether handling residential construction or bridge work in your job, this crane can help you get the work done! We at Superior Rigging and Erecting embrace core values of servant leadership, integrity, and straightforwardness and have been working hard for over 65 years to help you Make The Tough Look Easy! If you are in the Orlando or Atlanta area, contact us today for more information on this or any heavy equipment rental within our fleet to propel your job forward! The Link-Belt RTC-8080 is an 80-ton crane offering remarkable control, reliability, and capacity performance. With a standard boom of 41’-127’ and full power telescope system, this crane boasts a full power boom with market-leading capacity for its class and 4-link suspension with optional Hydro-gas ride system. The counterweight consists of one or two 9,600 lb. (4 354.5 kg) counterweights for multiple transport and lift scenarios. The outrigger pins eliminate guesswork by automatically positioning outriggers at midpoint position. With a superior method of axle control, the 4-link design consists of four linkage bars, a track locator bar, and two oscillation cylinders. Together, these components allow the axle to rotate in a side to side motion. Each separate pair of links are independent of the other, allowing the axle to rotate freely. This crane also offers superior operator comfort and capability, improved visibility and ergonomics with 4 – mode steering controlled from the steering wheel. Get the work done! We at Superior Rigging and Erecting embrace core values of servant leadership, integrity, and straightforwardness and have been working hard for over 65 years to help you Make The Tough Look Easy! If you are in the Orlando or Atlanta area, contact us today for more information on this or any heavy equipment rental within our fleet to propel your job forward! The Link-Belt RTC-8050 Series II is a rough terrain telescopic boom crane with a 50-ton maximum lift capacity and 110-ft maximum boom length. Perfect for construction job site lifts or industrial yard maintenance, this crane is able to traverse uneven or rough terrain. The maximum tip height on this crane is 168 ft. with a Confined Area Lifting Capacity (CALC) system that allows more effective operation in small work spaces. This newer, series II model of the RTC-8050 boasts numerous developments and improvements, including “A-max” boom mode allowing for more precise boom operation and BOSS, and exclusive boom stiffening system. The exclusive “A-Max” system provides optimum strength and stability. For in-close, big picks, the “A-Max” mode allows the operator to extend only the inner midsection of the boom. The hammerhead boom nose also allows the operator to work at high boom angles. Lightweight nylon head sheaves on the crane (including the optional auxiliary lifting sheave shown here) reduce overall machine weight and increase lift capacities, while the quick reeve boom head allows rope to be easily reeved over the boom head. This crane rental offers exceptional control, reliability, and capacity for all lifting and loading applications. Rent one today to get the work done!